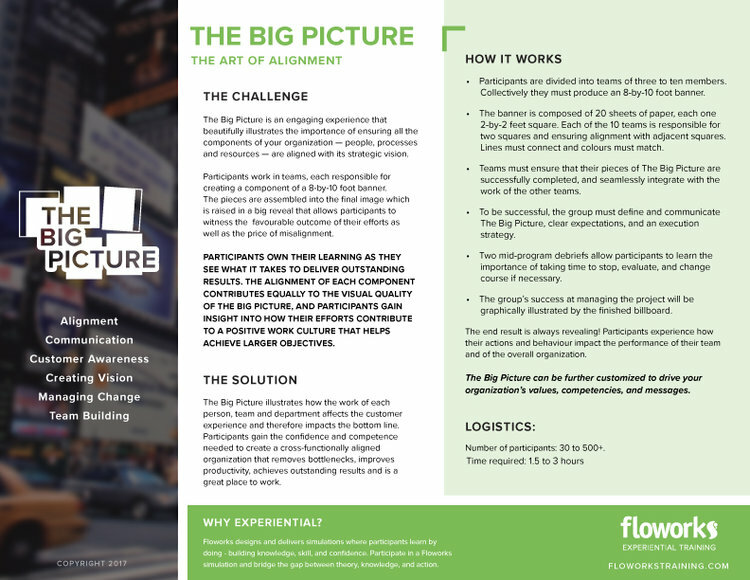 The Big Picture is an engaging experience that beautifully illustrates the importance of ensuring all the components of your organization — people, processes and resources — are aligned with its strategic vision. What is the price of mis-alignment in an organization? How might that be experienced visually and graphically? What is the value of taking time to stop mid-project, evaluate, and pivot? The Big Picture illustrates how the work of each person, team and department affects the customer experience and therefore impacts the bottom line. Participants gain the confidence and competence needed to create a cross-functionally aligned organization that removes bottlenecks, improves productivity, achieves outstanding results and is a great place to work. Two mid-program debriefs allow participants to learn the importance of taking time to stop, evaluate, and change course. The group’s success at managing the project is graphically illustrated by the finished billboard. The end result is always revealing! Participants experience how their actions and behaviour impact the performance of their team and of the overall organization. For more details about how it works, download the one-page program overview. The Big Picture can be further customized to drive your organization’s values, competencies, and messages. "I think that hands-on learning is very valuable because it mirrors real life in a compressed experience that is exciting, fun, and extremely revealing. This has so much more impact than a lecture or a PowerPoint presentation." "I was surprised and delighted to see the resources and talent we have right here on our team. When we step outside our traditional roles, we get to see what we each have to offer." "During the Big Picture, everyone was sharp and focused, and the experience revealed what was needed from each person involved. Together we solved problems in the moment, trusting one another, and then celebrating our success together. It was a real team effort." "I am a hands-on learner, and The Big Picture was a perfect way for me to be challenged. There is huge value in learning with and from your peers. Learning through experience is immediately translatable to my real life. I learned more in those two hours than I would have in a whole day of training, and I had fun while I was doing it too, which is a huge bonus." "It was really great to work with people from across the organization in a different way, and appreciate the depth of talent that is right here." "This was a great experience. We had everything we needed right here on our team to be successful. It was just a question of leveraging everyone’s ability and best effort to create something together." "We got to know one another more deeply as we stepped into this challenge together. We saw talent and leadership that we had never seen before."